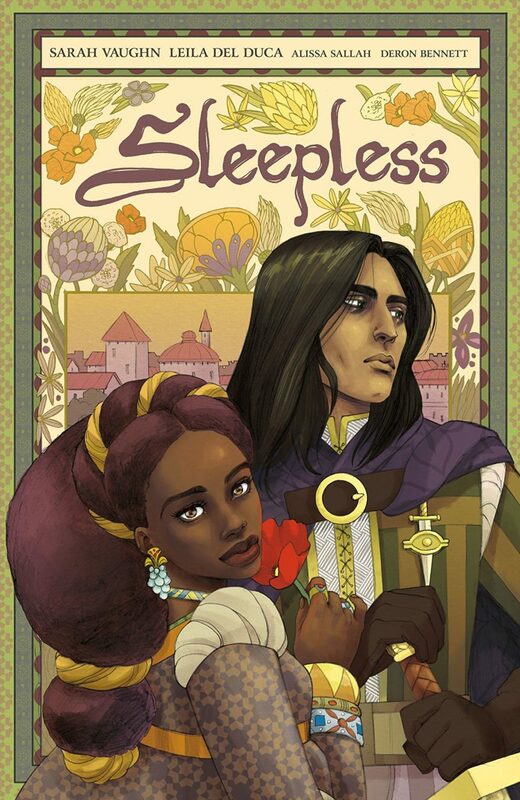 Sleepless, Volume 1 collects issues #1-6 into a single, gorgeous fantasy tome of magic, romance, and courtly intrigue. The story follows Poppy, the daughter of the recently deceased king of Harbeny, who wants nothing more than to retire to a quiet life away from court. This, of course, is not meant to be, as Poppy’s life is threatened by an assassination attempt which is thwarted by her stalwart bodyguard, Cyrenic. A member of the Order of the Sleepless, Cyrenic made an oath to defend Poppy with his life, forgoing sleep for so long as his body and mind can withstand it. To complicate matters, the new king, Poppy’s cousin, has insisted on her remaining in court to serve as mentor to his niece who, naturally, hates Poppy. Volume 1 primarily focuses on the conflict between the two women, Poppy and Cyrenic’s budding romance, and Cyrenic’s constant struggle to remain sane through the Sleepless curse. Sarah Vaughn has written a compelling story of magic and courtly intrigue in Sleepless, with subtle twists and turns sprinkled throughout to keep the reader on their toes. I’m reminded of other court drama-filled fantasy novels I’ve recently read, particularly The Goblin Emperor, with Sleepless falling squarely into that same genre. We’re given just enough world building with the religion and magic in this world to be intrigued, but not enough to give away how the magic works, a delicate balance in most fantasy tales which Vaughn handles exceptionally well. To avoid spoiling the small surprises and twists, I don’t want to reveal much more about the story than that. There’s romance, assassination plots, and hints of magic sprinkled throughout, setting up a solid fantasy story. 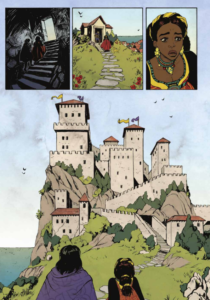 Illustrating the story are Leila del Duca’s incredibly detailed art and Alissa Sallah’s gorgeous colors, the two working together to set the mood for each scene. The opening pages of the volume demonstrate this well: Poppy and Cyrenic are in mourning for a recently passed father and liege. The scene is dark and richly detailed, with the light from Cyrenic’s torch putting the reader’s focus right where del Duca and Sallah want it. As the duo collect themselves and move on to face the coronation, they step into the brightly colored and wide open world above the catacombs. The contrast in mood and tone is so sharp that I felt I needed to squint as if I were stepping into the sun as well. The characters’ moods and thoughts are reflected in the detailed world around them, and I loved how the artists handled this. Page 15 from Sleepless Volume 1, art by Leila del Duca, Image Comics. Expressive details in each character’s movements and faces also help to put the reader in the heads of our main duo, which, for a clearly character-driven story such as this, works well to build a connection between reader and character. 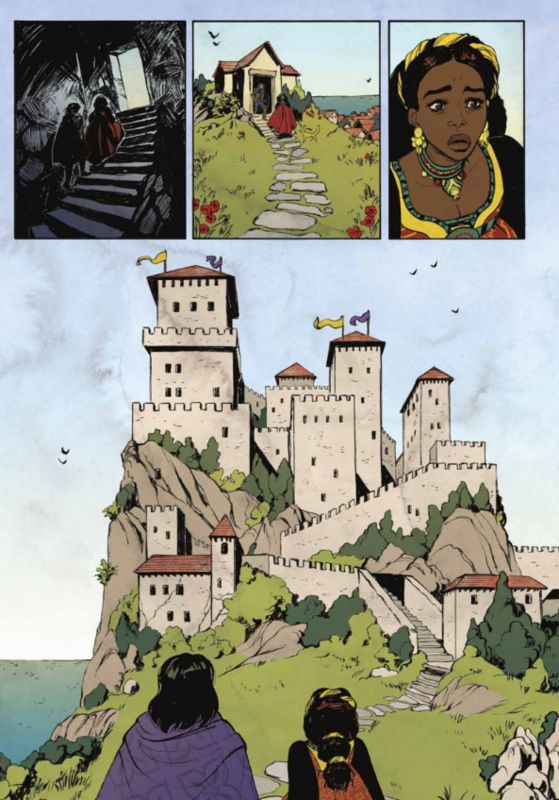 Courtly romance is very much a genre focused on individual characters, rather than action, and already with this first volume, I am incredibly invested in the story of Poppy and Cyrenic. The dynamic between them is an interesting set-up, with Cyrenic having pledged to become Sleepless for Poppy—an enormous commitment, one that will eventually cost his life—for reasons we’re not entirely sure of. Yes, he was committed to her father, but was that all? Poppy, for her part, has had Cyrenic to defend and support her for most of her adulthood, and that dynamic has now drastically changed in more ways than one. Of note, it’s Poppy who really changes their dynamic. While Cyrenic might’ve initiated their romantic encounter, it’s Poppy who has control. This is a welcome change to the typical fantasy dynamic. Ending on a gentle, romantic note (and cliffhanger! ), this first volume does an excellent job of setting the stage for plenty more drama and intrigue. 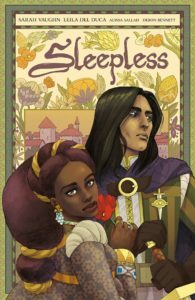 With compelling art, a great foundation of world-building, and the complexity of courtly politics, Sleepless promises a romantic drama that I believe most fantasy fans will enjoy.